In 1957, the citizens of the town of Moorheigh discovered that their local doctor was doing experiments on his patients, removing their hearts and using them to try to bring his dead wife back to life. The townspeople responded by executing Dr. Rendell and chanting a poem that goes, “This town has a doctor named Rendell/Stay away from his house because he’s the doctor from Hell.” They would have killed Dr. Rendell’s son too, except that Evan, Jr. escaped by sewing himself up in his mother’s corpse and then later using a scalpel to cut his way out. Thirty-five years later, Evan, Jr. (Larry Drake) returns to Moorheigh, looking to get revenge on the town. Because of his evil laugh, he is now known as Dr. Giggles and he has a medical-related one liner for every occasion. When Dr. Giggles learns that Jennifer (Holly Marie Combs) needs a heart monitor, Dr. Giggles decides to stalk her while killing all of her interchangeable friends. Dr. Giggles says that he wants to give her a new heart, preferably one that he’s ripped out of someone else’s body. Jennifer is not very appreciative. 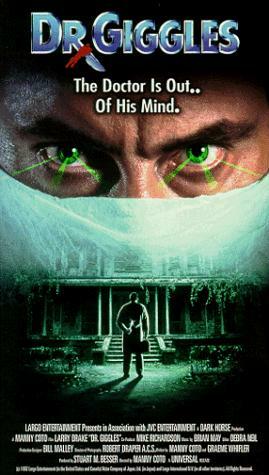 Dr. Giggles was meant to be a franchise started, in the fashion of the Nightmare on Elm Street and Friday the 13th films. It was a franchise that would never be because there wasn’t much that could be done with Dr. Giggles that wasn’t done during the first film. Larry Drake was a good actor but, other than the scene where he used a scalpel to cut himself out of a dead body, there was nothing about Dr. Giggles that distinguished from all the other horror movie slasher. He wasn’t a dream weaver like Freddy or indestructible like Jason. He was just a dude dressed like a doctor who giggled too much. For a better film featuring Larry Drake as a villain, do yourself a favor and watch Sam Raimi’s Darkman. This entry was posted in Film, Film Review, Horror and tagged Cliff DeYoung, Dr. Giggles, Glenn Quinn, Holly Marie Combs, Horror, Horrorthon, Larry Drake, Manny Coto. Bookmark the permalink.